I love anything with glutinous rice. 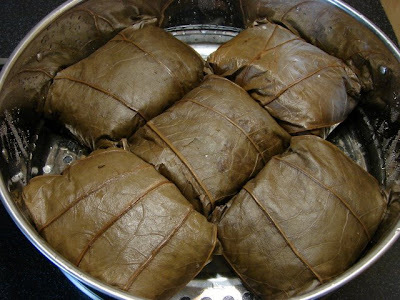 One of my favourite dim sum is lo mai gai 糯米雞 which is a steamed glutinous rice parcel with assorted filling. It's very easy to make, essential item is lotus leaf which is available in many Chinese supermarkets which looks like brownish green paper and fan shape. Lotus leaf is not expensive, one pack lasts a long time. 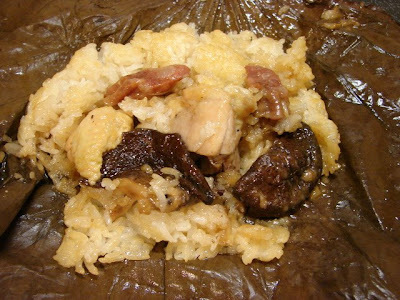 Lotus leaf gives a unique flavour to the rice parcel no other wrapper can be substituted. This recipe will make 5 parcels. Soak rice for 4 - 5 hours. Drain. Line a steamer with parchment paper. Put the rice on and steam for about 15 - 18 minutes till rice looks translucent. Take the rice out. Mix the rest of the ingredients for rice together and mix into the hot rice till all the liquid is absorbed. Cover and leave to cool. Cut the chicken into chunks, with or without bone. Marinate with soy, sesame oil, ginger, pepper and cornflour. Leave to marinate for about 20 -30 minutes. Soak the mushrooms with hot water till softened, cut into smaller pieces. Clean and mix with 2 tsp of cooking oil. Steam for about 20 minutes. (steaming with oil will soften the mushrooms more than without). You can leave the steaming if you can't be bother. Cut the sausage into 1 cm thick slices diagonally. Heat the wok, add a little oil and fry the garlic then add the chicken, mushroom and sausage, stir fry for about 30 seconds. Add shaoshing wine and oyster sauce, stir and add a little splash of water then finally thicken with slackened cornflour. Remove and leave to cool down a bit. Heat a large pan or wok with water. Add the lotus leaf one at a time, slowly pushing it into the water, careful dried leaves are brittle. Boil for about 10 minutes till the leaves are soft and supple. Rinse and clean the leaves. Cut off the hard centre stem. and cut the leave into half with scissors, each piece looks like a large fan. To wrap the parcel. Lay a piece of leaf, smooth side on top, on the woktop. Put on a lump of rice, spread it out a bit, then put on the filling and a little of the sauce. 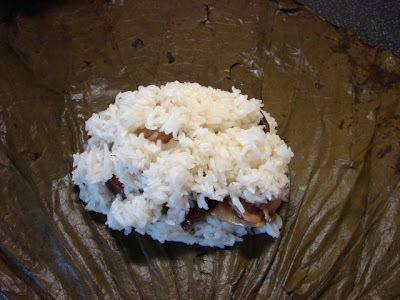 Then add another lump of rice on top to cover the filling. 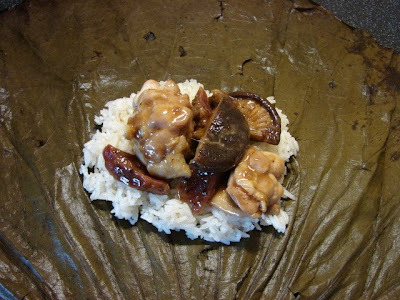 Wrap the rice like a parcel, trim of excess leaf if necessary. 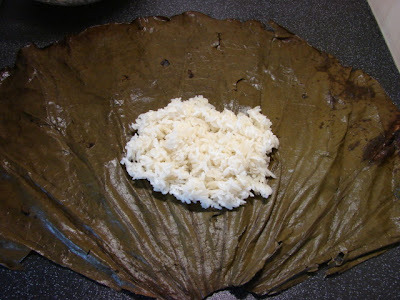 If there are big holes on the leave, making the rice sticking out, just patch them up with another small piece of leaf. If the rice sticks to your fingers and spoon too much just dampen with a little water. Put the parcel in a steamer with opening side facing down and steam for about 20 minutes on high heat. Ready to eat on its own, or with some chilli sauce/chilli oil and maybe a dash of soy. This parcel can be frozen after steaming. Defrost and re-steam for 15 -20 minutes till heated through. ** If you have some char siu (chinese bbq pork) or soaked dried scallop, these can also use as filling. I made it last night. It was delicious. Thank you! looks yummy. gonna try this recipe.thx for sharing. 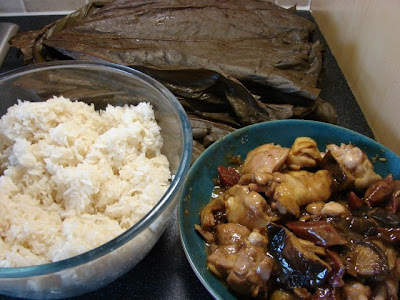 can i use bamboo leaves and use uncooked rice? This looks delicious. I was just wondering, can you cook the rice in a rice cooker first and then wrap them up, instead of steaming the rice? Yes. You can cook the rice in a rice cooker.